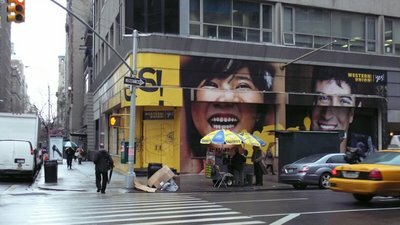 Public Ad Campaign: The Storefronts are illegal! I finally called the senior attorney at the Department of Buildings Sign Enforcement Unit and spoke to him about the storefront window wraps that have been appearing around the city in a wave of business closures. I was curious about the above Western Union wrap at 936 Broadway that had drawn my attention to this issue in the first place. A week after I had seen a stop work order plastered to the windows covered in advertising, those same notifications were gone. After revisiting the DOB website it was clear that the violation was still active and that those stop work orders had simply been removed by the building without resolving the problem. I wanted to know if there was a general rule regarding this new type of signage so I called up and asked the DOB. The definitive answer I got was that these ads, provided they are compliant with proper zoning regulations and are properly permitted, are like any other billboard and completely legal. Fantastic, so why don't these people bother getting permits? Other similar ad wraps have shown up recently and are also operating without permits. What I don't understand is the flagrant disregard for NYC law, which ends up being part of the reason that the public is so outraged. People like me would have very little recourse when complaining about signage in the city if those operating the signs would have the decency to run their business within the confines of NYC law. that same wrap-around ad is also located on the corner of houston & ludlow. If you can get the address, we can call it in. Always good to have a picture as well.